 When: Friday, September 27 - Sunday, October 6, 2019.  Directions to fairgrounds: Meadow Event Park is located between Fredericksburg and Richmond, just off exit 98 (Kings Dominion) on Interstate 95. The Virginia State Fair has historically been held somewhere around Richmond and Henrico county, but the ever increasing size of the fair meant that new, larger fair grounds were needed. In 2009 the fair moved to Meadow Event Park and will remain there for the foreseeable future. 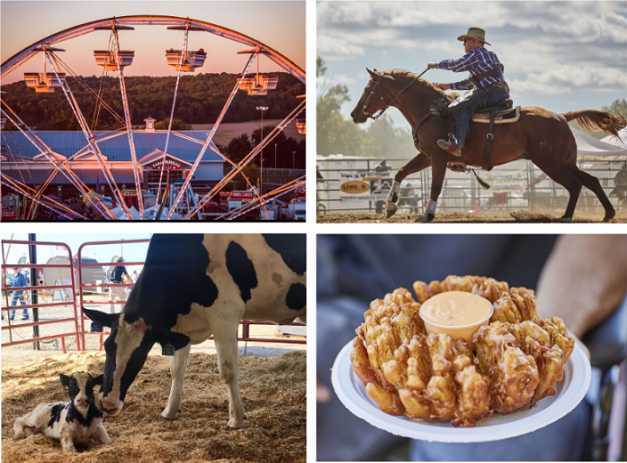 In 2019, the Virginia State Fair runs from Friday, September 27 to Sunday, October 6. The very first Virginia State Fair was held in 1855. The fair was held to promote agriculture and farming but like most state fairs it transformed in to a more public friendly event along the way, and farming and agriculture became just one of many attractions that the fair hosts to entertain and fascinate the public. That is not to say, however, that farming and agriculture have been forgotten. Animals make up a big part of the fair, and can be found competing in races and blue ribbon events, entertaining both children and adults at the petting zoo, and performing in rodeos. Another returning favorite at the fair is the huge collection of amusement park rides for kids of all ages. Harmon, Natalie Grant, Chris Lane, and Scotty McCreery. Past performers to headline at the Virginia State Fair have included headliners such as country stars Jake Owen, The Band Perry, The Charlie Daniels Band, along with favorite bluegrass bands. All concerts start at 7PM and are traditionally included with fair admission. This year, watch for the 2019 Virginia State Fair concert lineup to be announced over the summer. More popular attractions at the Virginia State Fair include the aerial show, which features wire walkers, jugglers, and all kinds of gymnastic performers, magic shows, motorcycle stunts, and a professional rodeo. Then there are the racing pigs, and not to mention the ever-popular snake handlers and alligator wrestlers. And of course a major mainstay of any state fair - FOOD - is in ample supply every year -- whether you choose a deep-fried peanut butter and jelly sandwich, chocolate-covered corn dog, or pumpkin funnel cake! State Fair of Virginia - The official site with information on admission and ticket prices, concert lineup, agricultural and livestock show schedules, directions, map, photos. Virginia State Fair - Wikipedia overview with historical highlights, information on popular attractions with photos and related resources. Fairs - Virginia is for Lovers - Fair fanatic? Check out the major fairs and festivals along with more on regional happenings throughout the summer months.